My keen interest in collecting vintage crockery started when I created my decades themed Pop-up Tea Shoppe for the Affordable Vintage Fashion Fair which was traveling down south for it's London debut in April 2009. 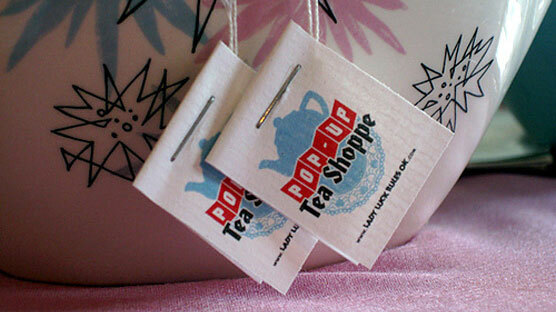 The logo'd tea tags we designed for the Lady Luck's Pop-Up Tea Shoppe. 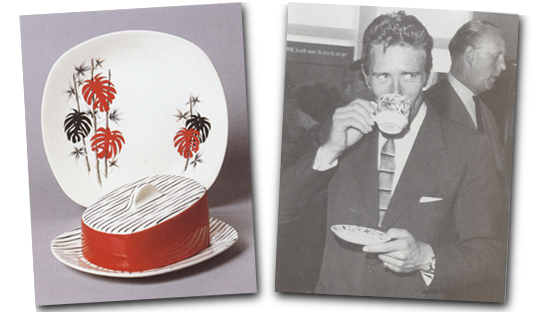 After pitching my Decades themed Pop-Up Tea Shoppe idea to Judy I had 8 weeks to source crockery from the 1930s through to the 1970s. Each of my 5 tables would have tableware exclusively from a particular era, along with parlour games and a waitress styled in the fashions from the decade. I also taught myself to bake and handmade all of the teatime treats. I like a challenge! After this incredible experience I developed a love for Midwinter pottery and in particular the two ranges which completely revolutionised tableware in the 1950s. 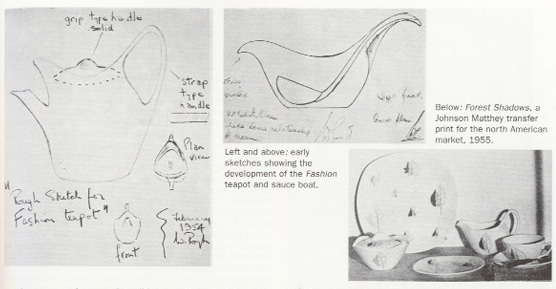 Early sketches showing development of the Fashion teapot and sauce boat, part of the 'new look' ranges. In 1951, the Festival of Britain had whetted the appetites of some sections of the public, showing a cleaner and brighter future with design and modernity applied to everything from buildings to kitchen utensils. Jessie Tait, the in-house designer at Midwinter said of her visit to the Festival that there was a sense of movement in the design world. Backed by Roy Midwinter, they developed a new look aimed at the younger market that wanted to make a statement with their home style. The Stylecraft and Fashion ranges were born. The Fashion Shape, created in 1952 was influenced by a style called ‘organic modernism’, a style which expressed the influence of natural forms on modern industrial design. There was also a move towards a looser and less formal approach to meal serving – a mix and match approach with different coloured lids was now an option. Russell Wright’s American Modern, and Museum and Tomorrow’s Classic by Eva Zeisel, were the ranges of ceramics that inspired Roy Midwinter’s new Fashion Shape. The Domino range is one of my favourites of the Stylecraft Shape with hand painted dots in relief. 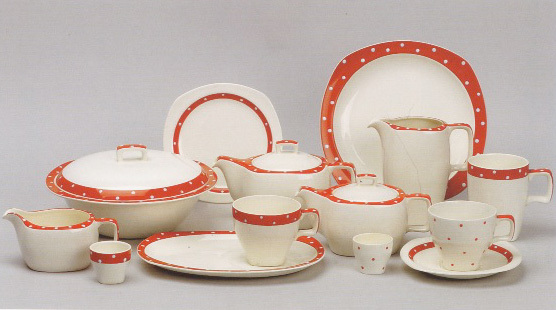 The Domino range was so popular many minor variations occur, possibly some were special orders or short runs. Notice in the photo above the bottom right hand tea cup is white with red spots. 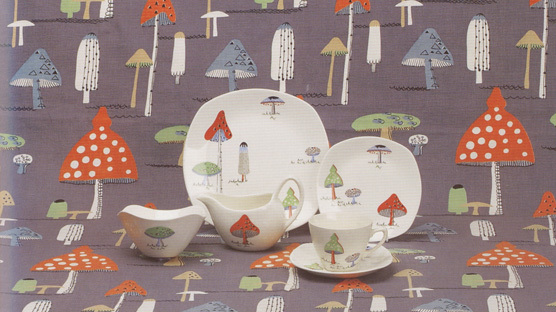 The 1956 Toadstools design adapted from a contemporary fabric. 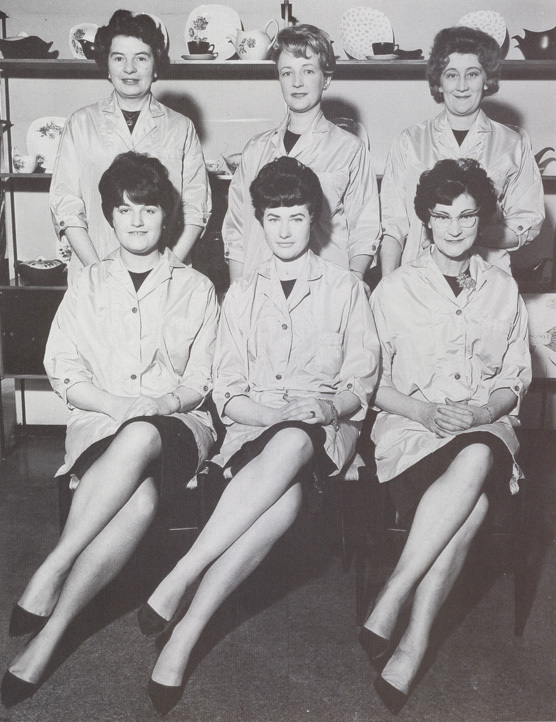 The Midwinter Showroom ladies in 1960. This is a great snap of the showroom ladies in 1960. Terence Conran had designed the Midwinter showroom along with a number of patterns for the Fashion Shape. Fashion Shape Mambo plate on the left and a Spanish Garden coffee cup on the right. My personal daily dose of Midwinter comes in the form of drinking my morning coffee from a Spanish Garden cup and saucer. Well, if it’s good enough for Lord Snowdon! Come evening time, we dine from Mambo dinner plates which I bought after my kittens ravaged my actual cheese plant. Teapot in the Fashion Shape with the Quite Contrary Desin. 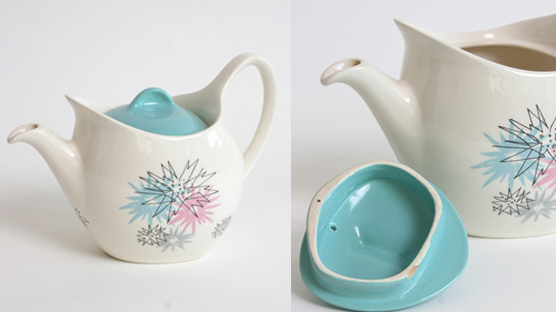 Start your Midwinter collection today with a Fashion Shape teapot decorated with the Quite Contrary motif. So pretty! The lively transfer printed design of exploding stars in pink, black and turquoise is such a magical colour combination. Check it out in the shoppe, click here. I hope to carry many more Midwinter pieces in the Thrift-ola shoppe in the future, that’s if I can bear to part with my finds! I love the Fashion Shape Mambo plate. Thanks for the interesting history, too! Just found your site and shoppe. Definitely loving! Just what the doctor ordered, thatniky you! I am searching for midwinter diagonal soup bowl (with handles) and stand/saucer. Found it in MLP shop but everything is in Japanese and cant get a translation. Can anybody help please ? 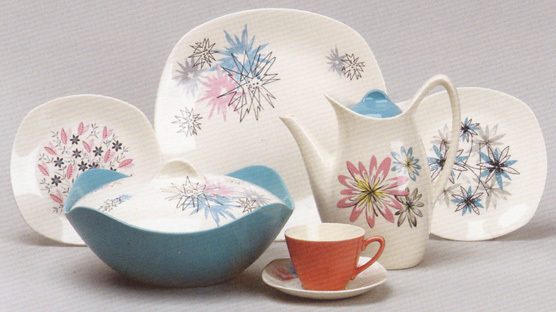 I have a range of pieces in the “Azalea” pattern (1959). Do you know if this pattern is very rare? I have found only one example of it on the net. We have a Stylecraft by MidWinter of Staffordshire Red Domino Dinner Service 1950 edition comprising of 6 dinner plates, 6 desert plates, 6 tea plates, 6 desert dishes, 6 soup dishes, 2 serving dishes with 1 lid, 1 meat platter and 1 bread and butter plate, which has been used but in very good condition, we are looking to sell would you be interested and if so can you confirm price you are willing to pay. am looking for quite contrary ceral bowl aloc pepper salt and mustard which my very young son thought would make good toy soldiers with the expectaed result! !